Wildlife watching in the desert will bring you face-to-face with a vibrant array of wildlife. From minuscule insects, to scaly reptiles, to feathery birds and furry rabbits, you’ll encounter a wide range of creatures there. To help you see everything the desert environment has to offer, bring a magnifying glass and a pair of binoculars in your suitcase. Make sure to plan your wildlife watching according to the animals’ waking habits. Many native desert dwellers are active at night (nocturnal) or at dawn and dusk (crepuscular), and disappear in the heat of the day. Ready to begin your desert wildlife watching adventure? You won’t want to miss these unforgettable locations! If you think a dry desert climate would be inhospitable to a thriving wildlife community, think again. Start your next vacation at this park to prove it. Saguaro hosts a massive array of creatures both large and small, including hummingbirds, slithery reptiles, sneaky coyotes, a distinctive range of insects, a raccoon relative known as the coati, and more. Though lizards and insects are perhaps the primary breeds that get to call desert parks home, in Arches, you may also spot a large mammal known as the mule deer. Another park known for its diverse and plentiful wildlife, Arches is a fantastic park to visit to get acquainted with all kinds of desert life. Wait for nightfall at this desert park in order to see the most distinct range of wildlife. On the list of what you’re sure to find? Black-tailed jackrabbits, kangaroo rats, and snakes. Make your way to the park during winter for your best chance to see some birds, who take advantage of the rodents’ and insects’ hibernation to make their presence known. Bears and bighorn sheep… in the desert? You bet! The Great Sand Dunes National Park and Preserve, which straddles desert and alpine tundra biomes, fosters an impressive range of animals that call both regions home. This distinctive park absolutely merits a place on your next trip itinerary. 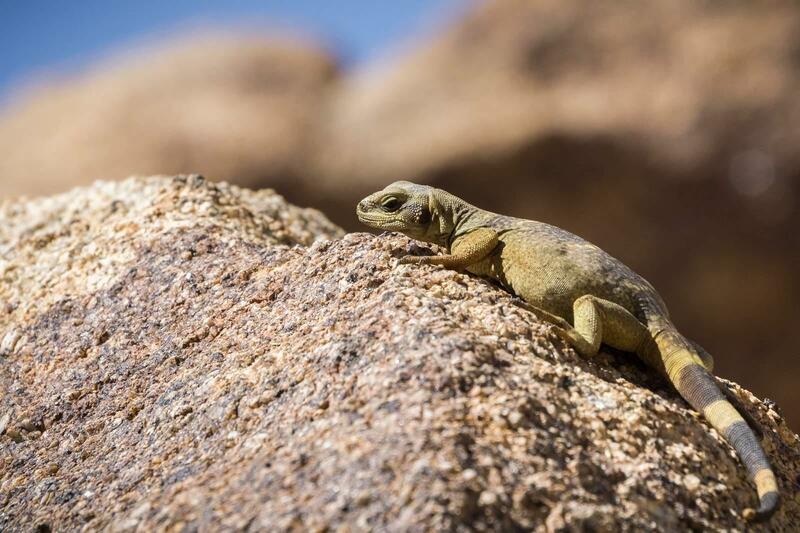 Wondering where else you can spot some great desert wildlife? Have another kind of wildlife or destination in mind for your next trip? Check out our blog post on wildlife watching by the sea. Contact the experts at Visit USA Parks, and together we’ll craft your dream vacation, making sure it’s full of memorable sights.